High-Intensity Interval Training (often shortened to HIIT) is a new trend in exercise. I won't get into the nitty-gritty of it, but the premise is this—instead of jogging along on a treadmill for as long as you can, you do a few "bursts" of maximum intensity, followed by a period of a slow, resting pace. You alternate between these two for a relatively short time. A typical HIIT workout lasts 15 minutes—and most of that isn't even the intense part. First several minutes you're warming up, last couple you're warming down, and in the middle you are only working hard in 30-second intervals. Mind you, those 30 seconds you are going at max, to the point that 35 seconds seems impossible. Does it work? Oh yeah. Although there are countless different kinds of exercise routines, the science consistently supports HIIT as a very effective means of improving your health. In those 15 minutes, you can accomplish more than you would in hours of "traditional" exercise. By bringing the intensity, you get better results in less time. It's a win-win. Now apply that to writing, and you have what could be the most powerful tool to consistently improve your writing output. Nobody wants to spend all day in front of their computer, picking away at that story, only to go to bed still feeling like you didn't do enough. The secret—just like with exercise—is in the intensity, which translates more as "focus" in regards to writing. Here's the basic recipe for a "High-Intensity Interval Writing" routine; set a timer for 25 minutes, and during that time be completely focused on writing. When the timer goes off, you take a break—five minutes is typical, but longer is okay too. Lather, rinse, repeat, and watch as your daily word count soars. The idea of working in 25-minute intervals was first made popular by the "Pomodoro Technique," named after the tomato-shaped timer that was first used (pomodoro is the Italian word for tomato). The strict Pomodoro Technique has you work for 25 minutes, take a 5 minute break, and repeat. Each one of those half-hour segments is called a "pomodoro," which becomes a fun measurement of time. After four "pomodoros" (or two hours), you take a longer break. 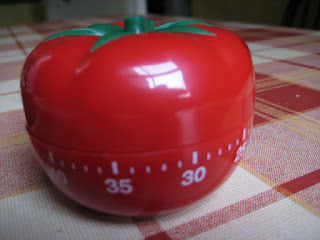 The Pomodoro Technique can be applied to most any task, not just writing. It works great because, instead of fighting the urge to check Facebook or respond to a text message, having a timer going forces you to focus. And you know that, soon, you'll have a break. It's so much easier to delay those procrastinating urges for another 25 minutes. Otherwise, if you're anything like me you might flip to another tab every three or four minutes, constantly breaking the flow of work. Let's go back to the exercise analogy for a moment. It's obvious that not everyone should follow the exact same workout routine—everyone is at a different fitness level. They function best at finding their own sweet spot, that level of intensity that challenges them without being undoable. Some people are challenged by lifting a 40-pound dumbbell, and more power to them. Others couldn't so much as budge that thing. It's just too heavy to be helpful. So I suggest you find your sweet spot with writing, too. Yeah, pomodoro purists will insist that a 25/5 minute sprint is best—and that's a great place to start—but what's most important is you find what works best for you. It might be that 25 minutes is just too long for comfort. 12 minutes in, your hands are twitching with the need to check Twitter—so experiment with a 10/5 or 10/2 burst. Or maybe you're just getting in the zone at 25 minutes, and find that break distracting. Give 40/5 a try! Once that timer goes off, you have one more job before guzzling down as much social media as you can in five minutes. Take a spreadsheet, and record how many words you wrote in that burst. Then you can Facebook like your life depends on it. There are three main reasons why you absolutely need to track your progress. One; Tracking progress tells you how long it ACTUALLY takes to write a book. Some people can crank out a novel in two weeks. Others peck away at it over several years. Neither way is "right" or "wrong," but it is important that you know how much physical time it takes you to write. If you track the results of your writing bursts, and find you consistently write 1,000 words per hour—any guess how many hours you'll put in on a 60,000 word novel? You need to know this stuff, otherwise you'll end up with unrealistic expectations. The power of science tells us people perform better when they know they are being observed. It's called the Hawthorne Effect, and it's a pretty powerful tool. You don't have to be a lab rat under the scrutiny of unfeeling scientists to gain the benefits, either. By tracking your own results, you strangely become both the observer and the observed. You are holding yourself accountable, and even if you keep your results private, you will still want to impress your own ego. Three; It becomes a game—one which you want a "high score"
Do you love games? I love games. A lot of games record your "high score" when you do really good. I don't know about you, but I love trying to get a new high score, doing better than ever before. 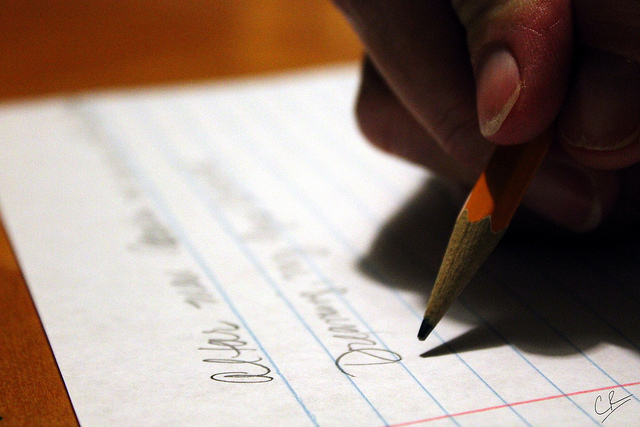 If you record how many words you wrote in a writing burst, you'll subconsciously want that number to go up. What a great motivator to "beat your writing high score!" You can use any old timer for this, but I do have a preference for e.ggtimer.com. Why? Because there is no pause button! Once you start a timer on that site, there is no way to pause or stop it. That forces me to follow through. In the past I've used other timers, and found if something came up, I'd just pause the timer for a few moments to take care of it. With e.ggtimer.com, I have zero excuses. If it's truly critical I take care of it that moment, then fine. But it's coming off my word count for that pomodoro, so I avoid letting myself get distracted unless it's truly urgent. What If You're Surrounded By Distractions? As I write this paragraph, my two year old is having on-and-off bursts of rage and calm, and the sound of children's shows ring in my ears almost constantly. Other times my nine year old descends from his room, looking to socialize with daddy. There are times I can go hide in a distraction-free environment and get serious writing done, but if that was the only time I could write, it wouldn't matter how fast I typed—it would still take forever to get anything done. I'm a stay at home dad. My wife has a job outside of the house and is going to nursing school. Which means I'm running the household while building a writing career. I can't rely on removing distractions entirely. It's just not in the cards. So what do I do? I write anyway. On my progress spreadsheet, I keep track of the environment I'm writing in, not just the word count. If I'm alone in my basement man cave, I typically write faster than if I'm juggling writing and kids. Here's the important thing, though—I don't let distractions stop me from trying my best. If my kids need something, I'll take care of it. But as soon as they are good I snap right back to work, because that timer is ticking and it stops for no toddler. I might not get as much done during those times, but writing doesn't happen in a vacuum. You have to make it fit with the rest of your life. You want to know something else? My current "high score" for a 25 minute writing spree happened while my wife was away and the kids were my responsibility. Sometimes you surprise yourself, and find you can do more than you thought possible. My results have skyrocketed since using High-Intensity Interval Writing. The pomodoro technique has always worked well for me, because I have a habit of letting my mind wander. Below is a portion of my spreadsheet for one day. This was the day I talked about at the beginning of this post; I ended up writing 5,300 words, and it was a very relaxed pace. I didn't have to work myself to the bone; in fact, I had a very enjoyable day around that writing. *I only wrote for a few minutes to finish up a chapter here. Otherwise, these were all in 25 minute bursts. Keep in mind, your writing speed will vary from mine. To a lot of people that might seem like unrealistically fast writing speed, and I know others who can write much faster than I can. You aren't competing with me, though; you're competing with yourself. Can you see how tracking this gives me a better understanding of my own writing habits and speed? I guarantee you, I was writing a lot faster when tracking it than when I wasn't (that Hawthorne Effect again). Regardless of the circumstances, something as simple as setting a timer and recording my word count has improved my writing speed. It keeps me focused, in the zone, and prevents my mind from drifting off course. It's not sacrificing quality for speed; it's eliminating the things that slow you down. Now it's your turn; what do you do to improve writing speed? How do you fight off distractions? Do you use something similar, or do you have your own methods? Leave a comment—I'd love to hear about it! This is such an insightful, helpful article! It makes definite points and isn't at all boring, like some very informative articles. 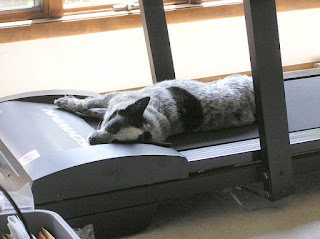 Great help here, whether exercising, writing, or (I'm thinking) could be adapted to any activity in your life........thanks! Wow... what an awesome concept. I really like it, and it makes sense. I also like that you track the music you play. That could be very telling as well. It really can! Sometimes I have no music (just the sound of kids in the background), often times I use a site called coffitivity (https://coffitivity.com/) for a little noise. I like having "mood music" for certain scenes, but find I spend too much time looking for the right track for a scene instead of just writing it, haha. I've recently started using this strategy in my own writing, and the progress I'm making is incredible! In two sessions totaling one hour, I wrote significantly more than I normally do in an entire day. I'm very glad I read this article - super helpful and informative.